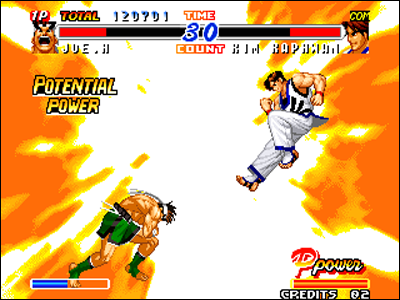 Fatal Fury saga also had some special episodes, sort of 'Dream Match' games, occurring out of the main frame. 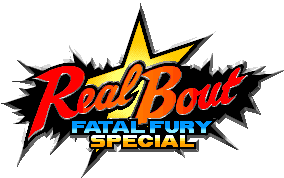 Just as The King of Fighters saga had its Kof 98 and Kof 2002 opus - Bogard brothers were entitled to three games of this kind: Fatal Fury Special, released in 1993, Real Bout Fatal Fury Special, released in 1996, Real Bout Fatal Fury 2, released in 1998. 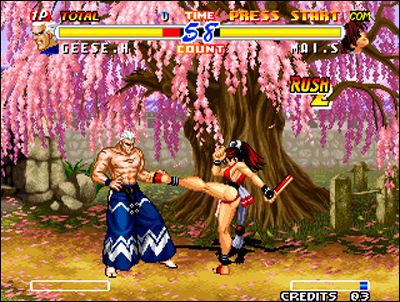 These are providing the reappearance of dead or missing characters in the main story. 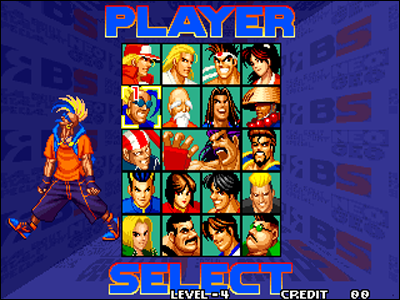 16 selectable characters in 1993 is the cream of the crop! 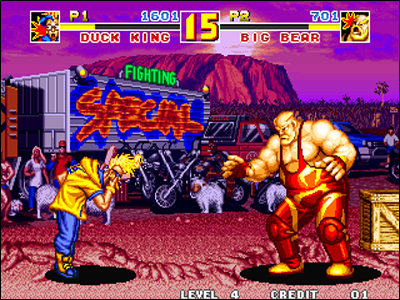 Fatal Fury Special is the first 'Dream Match' game of the saga. 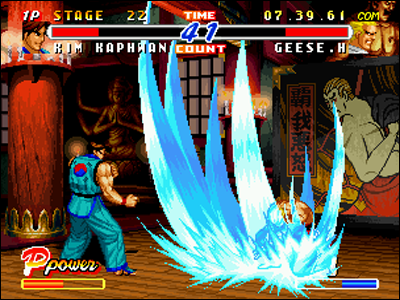 This mixes twelve Fatal Fury 2 protagonists, and adds three iconic Fatal Fury fighters, namely the late Geese Howard, the incredible Tung Fu Rue, and the fanciful Duck King. 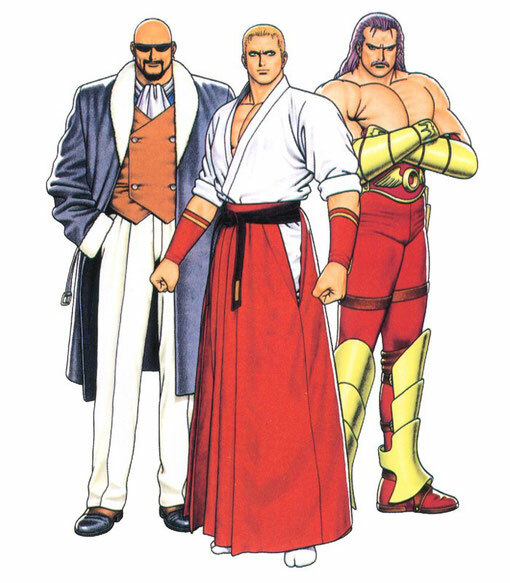 For my part, I would have prefered see Hwa Jai and Richard Meyer coming back, but they surprisingly didn't ask for my opinion. 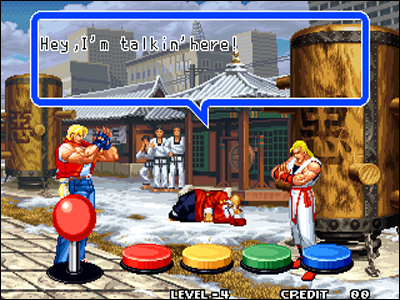 Another pleasant surprise, Ryo Sakazaki, a former hero of the Southtown Art of Fighting parallel series, is present in the game. 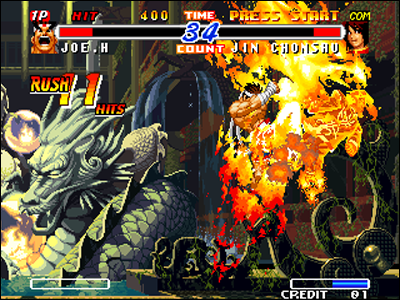 He's here as the hidden ultimate boss of the game, that only players having performed a faultless run will encounter. 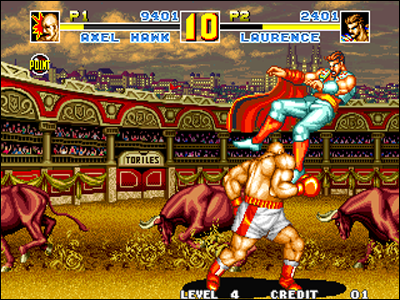 RBS remains one of the favorite episode of the aficionados. 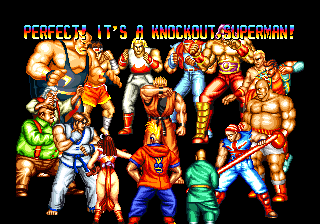 This dream-match game Real Bout Special takes almost all characters featured in Real Bout Fatal Fury and adds protagonists of ancient episodes. 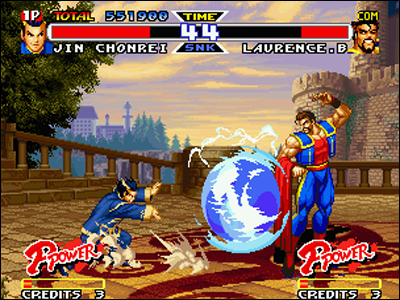 The roster consists of RBFF one plus Tung Fu Rue, Wolfgang Krauser, Laurence Blood and Cheng Sinzan that we had not seen since Fatal Fury Special! 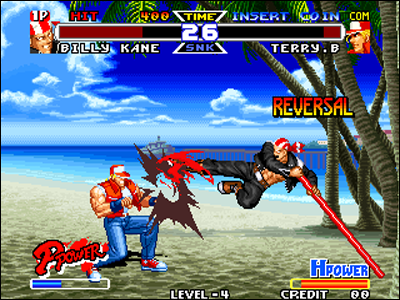 SNK took the opportunity to considerably refresh its series: gameplay and realization are brand new and impressive, and it's a big slap! 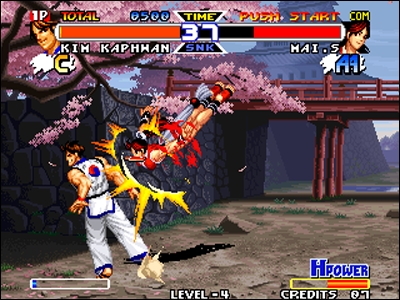 All graphics are amazing, whether entirely new background or re-drawn fighters' sprites showing brand new animation, much more smooth and fast than before, plus a soundtrack also 100% new. 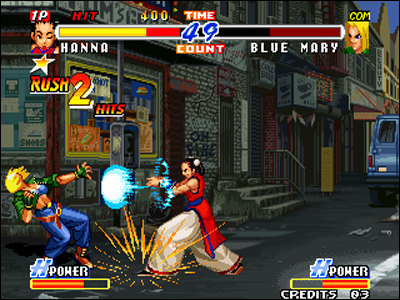 In every episode, Mai is more and more lovely. 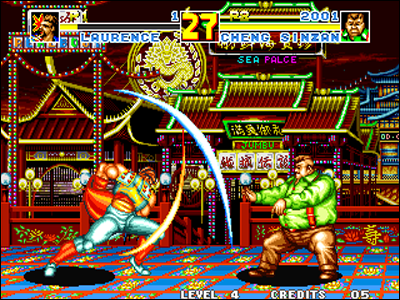 Released two years after Real Bout Special, Real Bout Fatal Fury 2 keeps the game engine in its entirety, but offers new backgrounds and three newcomers: Rick Strowd, Lin Fei Xian and the aviator Alfred. 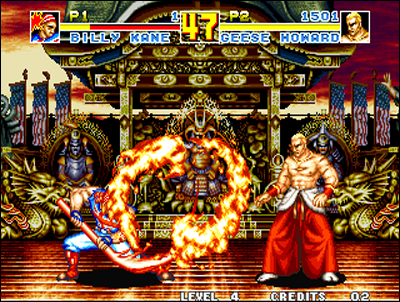 These three fighters are virtually exclusive to this game, because Rick and Alfred will not reappear in other SNK games on Neo Geo, while Xian Fei will only be playable in two other titles: The King of Fighters 99, in which it was preferred to Rick, then as a striker in KOF 2000. 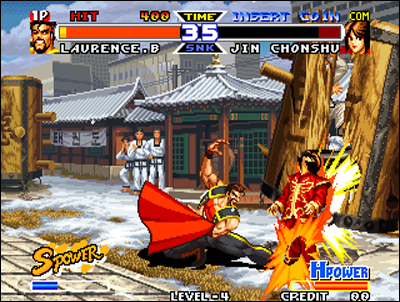 Of course, the King of Fighters tournament is held every other year in the "King of Fighters" games, and you can find most of the protagonists of our saga in these releases. 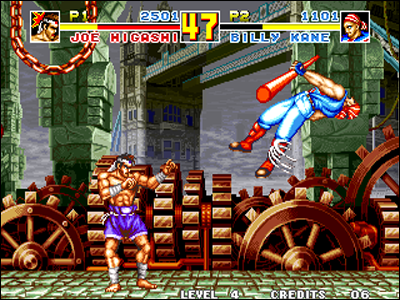 Right since 94, Joe, Andy and Terry are part of the new saga; Kim is also there with his team (Chang and Choi), representing Korea, for its May with two other fighters (King and Yuri) that represents England. 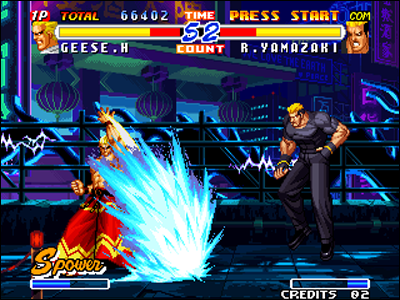 Among the most noticeable appearances if any, Geese Howard and Wolfgang Krauser are back in the 96' game, and we also have seen some familiar faces return as strikers in KOF 2000 ... 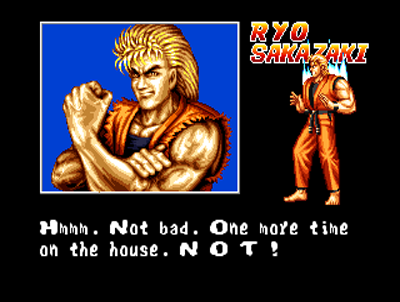 Friendly! 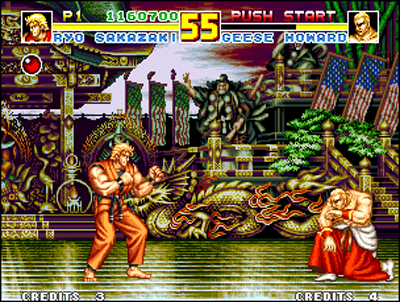 In addition to its endearing characters, its dramatic history,and Dantesque battles, the Fatal Fury saga vehicle many values ​​through its charismatic characters. 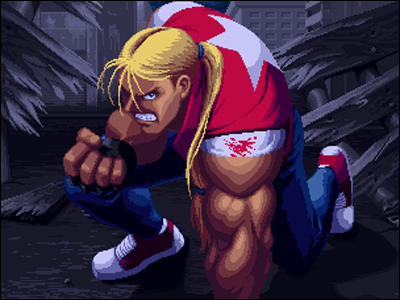 Courage, determination, forgiveness, through eg Terry Bogard. 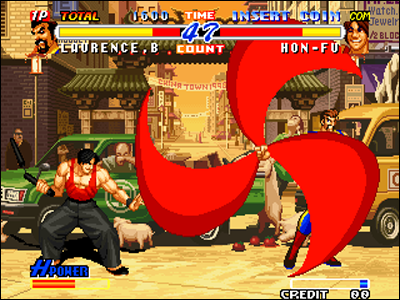 Compassion, sense of values, simplicity like Kim Kaphwan; the pugnacity and inflexibility of Geese Howard, the serenity of Tung Fu Rue, or the perfectionism of Wolfgang Krauser; the sensual elegance of May, or even the unwavering loyalty of Billy Kane. 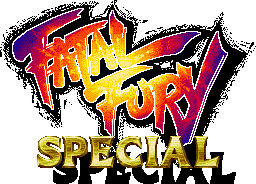 A series full of twists and emotions, I hope you will enjoy or already enjoy, as much as we do!